Members in Liberia, Stewart Corporation have recently won and executed a UN contract for transporting a full shipload consignment of heavy equipment and vehicles from the UN compound in Monrovia to Laayoune in the Western Sahara. 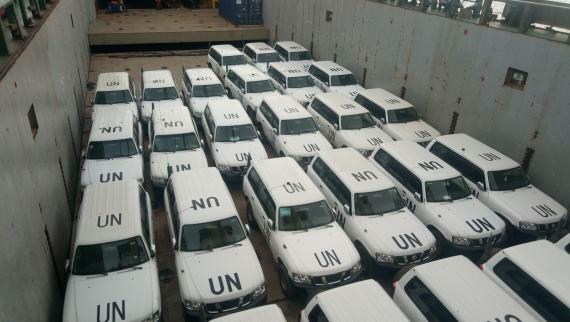 Over 64 SUVs and numerous heavy equipment vehicles had to be moved to Laayoune as part of the UN mission in the region. Stewart Corporation provided a 'one stop solution' by taking the entire consignment as a full shipload, executing the whole operation in one go. Despite facing difficulties due to the absence of enough car carrying trailers in Liberia to move the lot to the port, Stewart Corporation managed to seamlessly execute the assignment in time and the full consignment was successfully delivered within the promised timeline.